V7.0.2 of Pocket Casts thankfully brings back the wanted multi-select option. 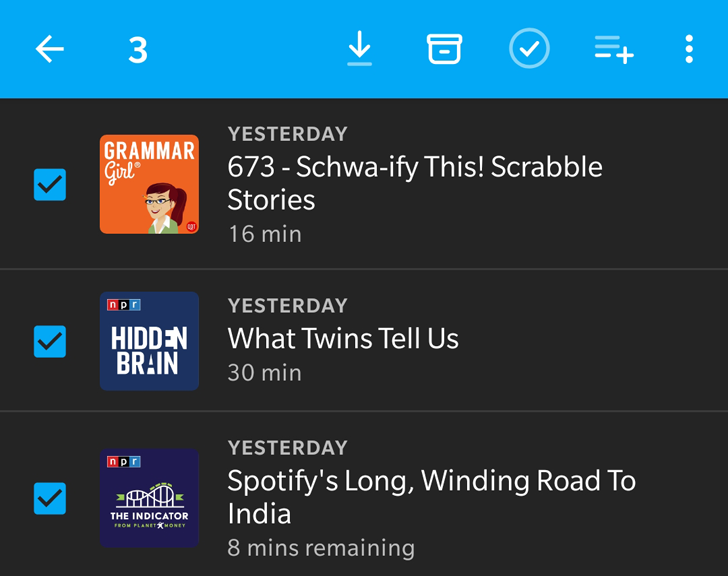 You can select as many episodes as you want in a filter or podcast, then either download them, archive, mark as played, add them to your Up Next queue, or tap the overflow button to quickly deselect/select all. Adding to Up Next is also special in that it will happen in the same order you selected the episodes. Neat. This definitely beats performing those actions one by one, which was one of my main gripes with the new UX. I'm still not a fan of the interface, but if the team is sticking to its guns, I guess I better get ready to make the jump on my main phone. Multi-select in filters and podcasts. Another addition is the option to sort episodes in a podcast by downloaded, unplayed, or by season. And finally, you can star episodes from Android Auto if you're listening while driving. Left: Group episodes in a podcast. Right: Episode actions in Android Auto. Version 7.0.2 of Pocket Casts also fixes many bugs. You can grab it from the Play Store and see if it's better now. Still no custom playlists though.